**Update! Hannah’s Heart and Love is officially a 501(c)(3) non-profit organization as of September 1st, 2014. But we are still in desperate need of donations both monetary and item donations. Any and all support is so greatly appreciated. Losing our first and only child was one of the hardest things we have ever had to deal with as a couple. It was full of heart ache, confusion, sadness, anger, and so many other emotions that making a list is nearly impossible. When we first received the news that Hannah had some things that would make her chances of survival slim, we were lost. What made this even harder is that there was really no where we could turn. During the time from when we found out and even after she had passed away, there seemed to be a general lack of knowledge and support for us to turn towards. Of course we had the support of our family and friends, but there were minimal resources available to help us. Losing Hannah created a whole list of things that we now had thrown at us and didn’t know how to handle. How do we handle such grief? How do we explain ourselves to people? How do we go home from the hospital with empty arms? How do we plan a funeral and how do we pay for it? This is just a few of the things that started going through our heads. We had no answers, no where to look for answers and were forced to start working on these things on our own. Before we lost Hannah, we could never fully understand what it is like to lose a child. We didn’t realize how real and painful this is. There is a general lack of education and conversation about this topic. People do not have a true understanding of everything that this tragic situation brings with it. Many people, it seems just assume it all just goes away. They think that people just move on and that it’s like nothing ever happened. It is not just a minor thing that passes or fades. I know this and feel this every time I see a baby or see an outfit or a photo frame or hear about people expecting because I know that at the end of the day, we had to go home without our baby. The pain that we feel every day is absolutely real. Our daughter is absolutely real. 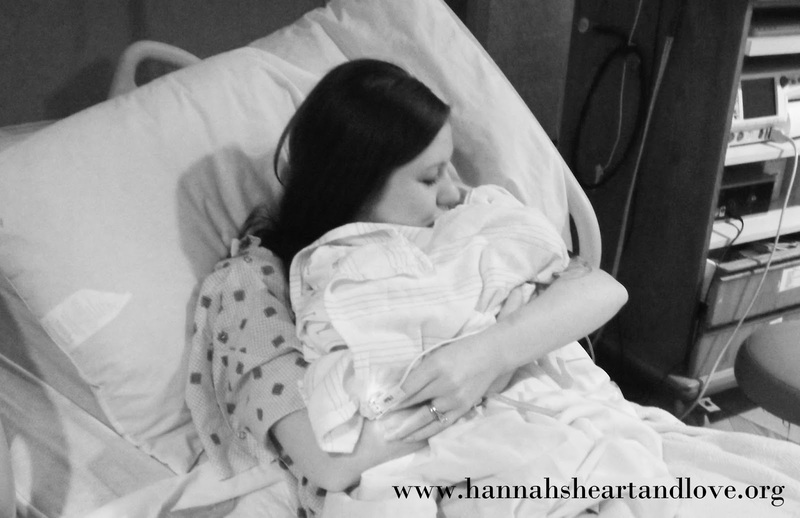 It is because of all of these reasons that we decided that we wanted to start Hannah’s Heart and Love. The idea is to create a non-profit whose goal is to help families through the tragedy of baby loss. With Hannah’s Heart and Love, we want to be able to provide aids and resources for the families who have lost. We also want to provide “recovery boxes” to help the new mommy who is on the mend. Finally it is also our goal to raise awareness and to educate people that baby loss is real and that it is not just something that will go away with time. In order for us to be able to help others, we need your help. We are currently in the process of getting this non-profit off the ground. The money that we are hoping to raise will be to help us pay for all of the fees and costs associated with starting such a venture, as well as used to help create packages and print materials to be used to help spread the word, educate people, and get our resource into the hands of those in need. We have gone through this tragedy, but we don’t want our loss to just be the end of things. We want to be able to take this bad experience and use it to help others. Please help us to bring support, healing, and education to the people who need it. We thank you in advance for your support.